The Alpine Visitor Center at the corner of Holland Avenue and 3rd Street (106 N. 3rd) prepares a weekly activities calendar for Alpine. Click here to download the calendar for the week of April 15, 2019. A 3 course meal for you and that special someone on February 14th! The courses will includes, chocolate strawberries with champagne or prosecco to start off with. 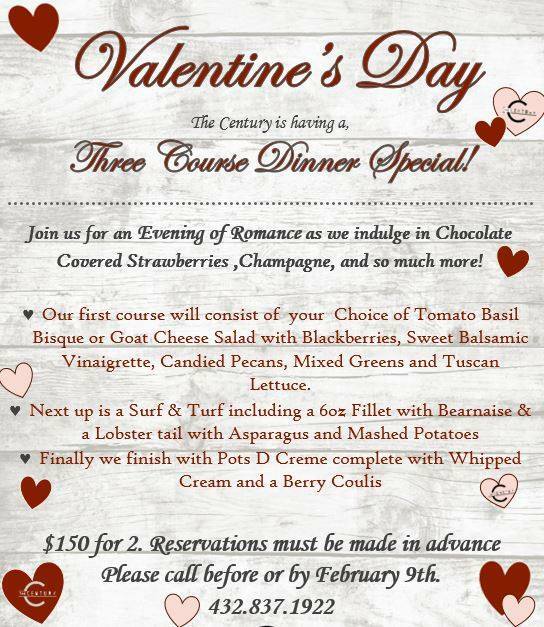 Then we will dive into each course starting with your choice of a soup or salad, Surf & Turf with mashed potatoes and asparagus, finished with a Pots D Creme with whipped cream and a berry coulis! $150 for 2, please call in your reservations by or before February 9th.